Today, the U.S. Supreme Court decided not to take up the challenges in the lower courts to the Trump administration’s decision in Sept. 2017 to end the Deferred Action for Childhood Arrivals (DACA) program. Senate Majority Leader McConnell is expected to propose a bill this week that would authorize $5.7 billion for the wall, hire new border patrol and enforcement agents, and significantly increase the number of immigrant detention beds. This bill fails to provide real long-term relief for undocumented youth, including those who were unable to request DACA following its rescission, and to protect individuals from all Temporary Protected Status (TPS)-designated countries for which TPS is being terminated. 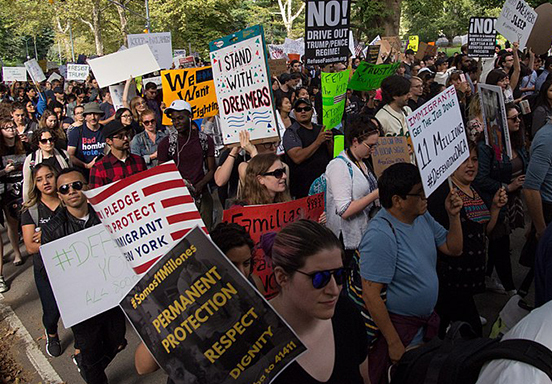 “We urge that individuals who currently have or have had DACA to apply to renew their deferred action and work authorization,” said Annie Wang, the director of AALDEF’s Immigrant Justice Project. In November 2018, after the U.S. Court of Appeals for the Ninth Circuit ruled that the termination of DACA was unlawful, the administration requested that the Supreme Court consider the DACA litigation. With the Supreme Court declining to take up these DACA cases for the remainder of its current session ending in June 2019, those who are currently protected by DACA have the opportunity to renew.